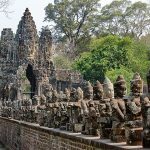 Our 23-day Vietnam Cambodia tour package is perfectly designed for those who are looking for a unique tour to deeply explore gorgeous Cambodia, see Vietnam differently. 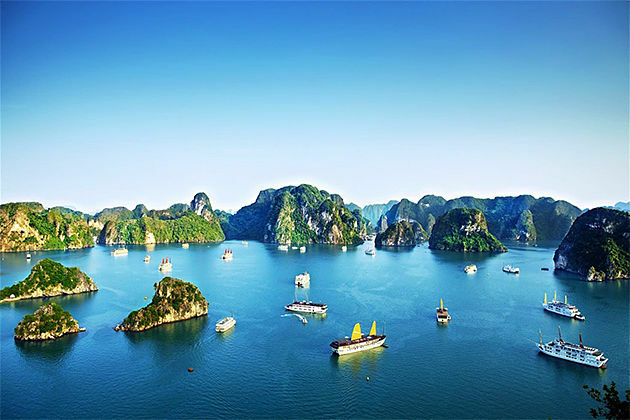 Experience the best insights into Cambodia ’s and Vietnam’s culture, historical attractions, admire to see the spectacular rice field terraces in Pu Luong and tranquility experience the relaxation on a cruise on magnificent Halong Bay. Be seduced by Angkor Wat’s knobbly temples, aroused by active adventures via deep, long caves, curvy beaches and many more. 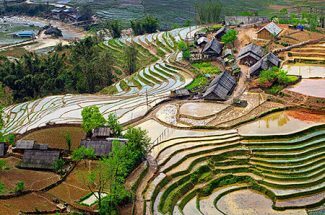 Contact Indochina tours now and explore all fascinating secrets about these two Indochina countries in your Taste of Vietnam & Cambodia – 23 Days. Welcome upon arrival in Hanoi your local tour guide and driver, we then transfer to hotel. On the way, we stop at a local restaurant for Pho (Beef Noodle). 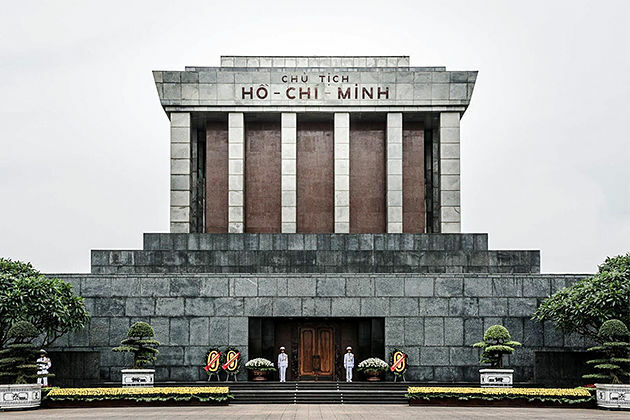 After breakfast, we start our journey today by a visit to Ho Chi Minh Complex, marvel at Ho Chi Minh’s mausoleum, Ho Chi Minh’s house on stilt, the Presidential Palace, and the One Pillar Pagoda. 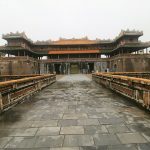 We then head to the Temple of Literature which originally built as a temple to Confucius and was the first university of Vietnam dating back to 1070. 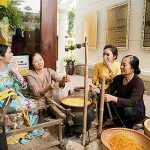 After lunch, we keep on visiting the Museum of Ethnology, which is widely acknowledged as the best in the country and has an extensive display dedicated to Vietnam’s 54 Ethnic minority peoples. Afterward, we are back to the center city to take one-hour cyclo around the 36 streets of Hanoi Old Quarter. 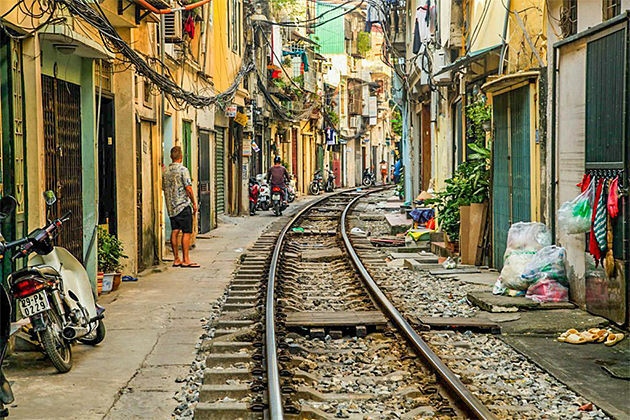 This bustling area of narrow streets and alleys houses various colorful businesses and shops. 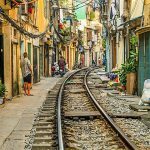 We also move to Long Bien iron bridge and Tran Phu train track. Last but not least, we will end up your tour by enjoying the unique Water Puppet show. Pick-up at hotel, we transfer to Halong Bay with a short stop at Hai Duong Province for a break. Arrive at Hon Gai Pier at around noon, we check in the prepared cruise, enjoy welcome drinks and follows by tour guide safety briefing. 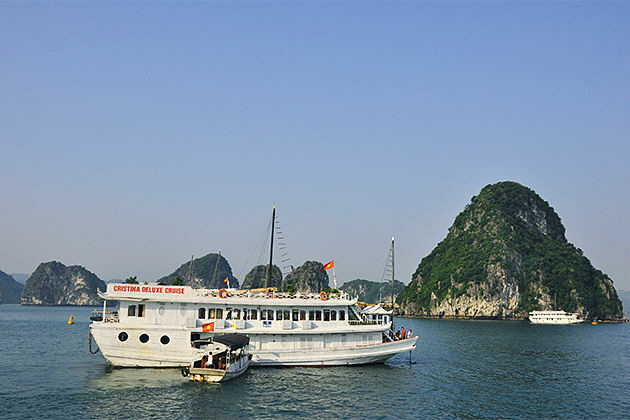 Lunch will be served with a set menu at the restaurant while cruising through the sightseeing beautiful landscape and limestone mountains in Halong Bay.We then visit and explore the formation of stalactites and stalagmites in Thien Son Canh Cave – one of the biggest grotto in Bai Tu Long Bay. Back to your cruise for a tea break before kayaking around the area or just relaxing on the sundeck. 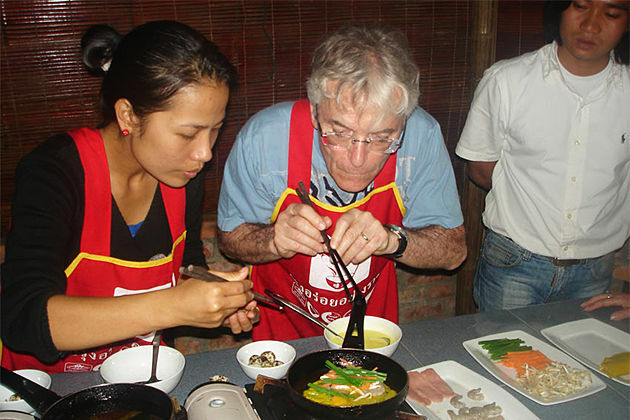 In the late afternoon, we enjoy cooking class – making spring roll while the boat goes to the Cong Do – point to stay overnight. Dinner and spend the night on board. Start our new day with Tai Chi lesson on the sundeck. Enjoy the sunrise while breakfast is served at the restaurant. The boat is moving outside the bay through the hundreds of amazing rocks and going to Cap La. 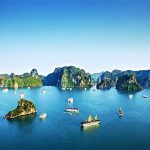 Drop anchor at Cap La to discover Cap La Geological Park by kayaking to see the panorama of Bai Tu Long Bay with thousands of islets around. We can stay on the private beach for kayaking. 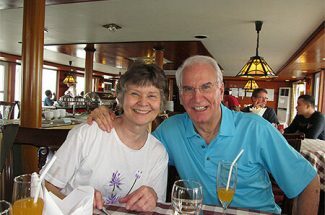 Then we are back and have lunch on the boat in a romantic area of Bai Tu Long Bay. 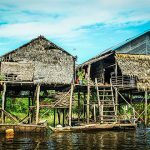 In the afternoon, we visit Vung Vieng floating village – the biggest one, quiet and peaceful place in Bai Tu Long in a rowing bamboo boat. 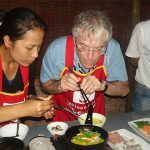 Enjoy cooking class – making spring roll while the boat goes to the Cong Do area – the second night on the bay. Enjoy the sunrise while breakfast is served at the restaurant. 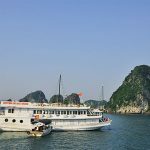 After that, we kayak in Cong Do and Be Ong Dau area or stay on the boat for relaxing, taking photographs… Then the boat gets back to Hon Gai Pier. Farewell to the crew members and get on our car to drive back to Hanoi. You will arrive in Hanoi in the early afternoon. Drop off at the hotel and free to shopping this time. 07:00 – 07:30: Pick-up at Hotel to go to Pu Luong Nature Reserve by bus. 09:00: Have a short break in Luong Son (Outside of Hanoi). 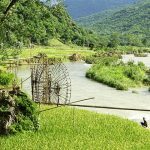 11:00: Stop at the local market of the Muong Ethnic Minority; feast your eyes on the beautiful scenery of Thung Khe Pass (One of top 10 most beautiful passes in Vietnam). 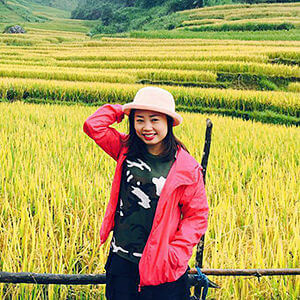 13:00: Check in and have lunch at Pu Luong Eco Garden – The Mountain Retreat. 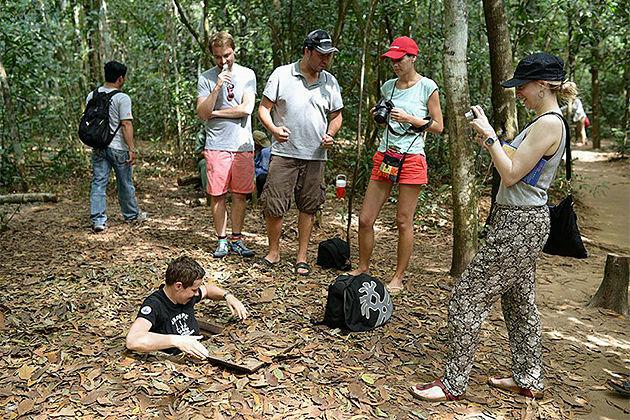 14:30 – 17:30: Time for you to venture through the natural beauty of the area. Following the small road through the terraced rice and sugar cane fields, cross the Hanging Bridges to visit other remote rural villages of Thai Ethnic. 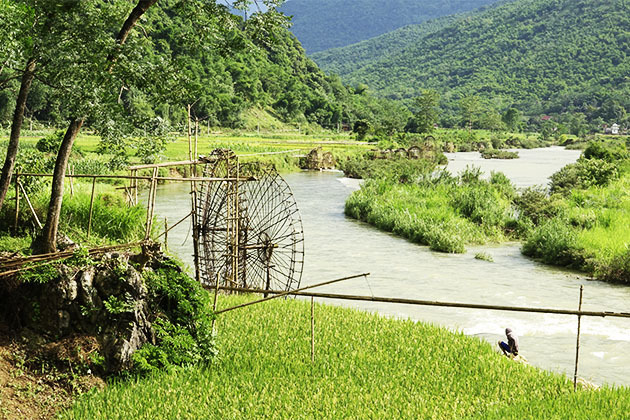 Stop at the giant waterwheels, ducks farm to learn about the agriculture before getting on the Bamboo Raft for a relaxing cruise on Cham stream (cruise depending on weather conditions). 19:00: BBQ Dinner will be served at the lodge. Enjoy the cool atmosphere. Overnight at the Eco Garden – Mountain Retreat. 07:00 – 08:00: Have breakfast in the lodge. Enjoying the breathtaking view from the resort. 12:00: Back to the resort, check out. 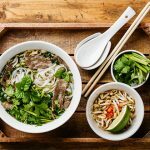 13:00: Have lunch and have free time to relax or walk around the village before taking a quite long drive to Ninh Binh at 14:30. 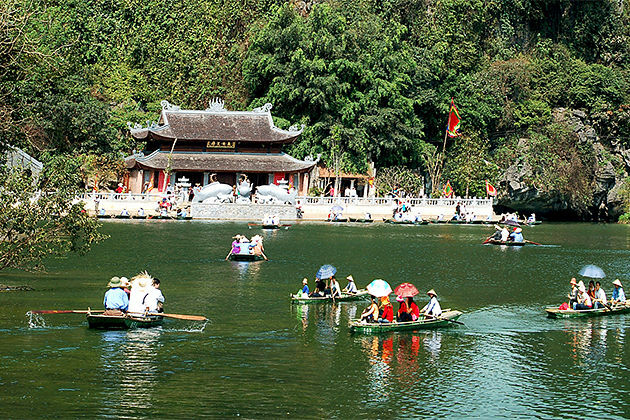 17:30: Arrive in Ninh Binh, check in the retreat and free at your leisure. 19:00: Have dinner at the retreat. Overnight in Ninh Binh retreat. 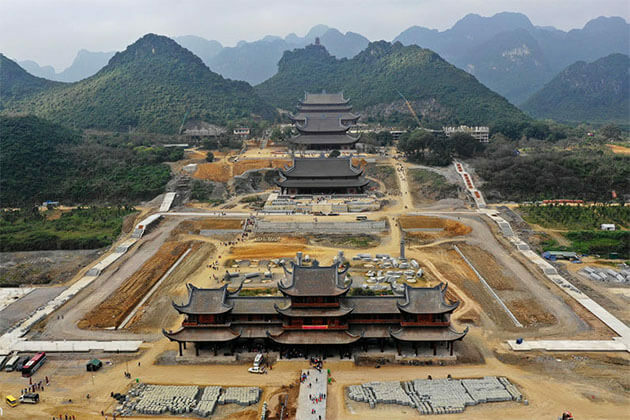 8:30 to 12:00: Cycle through the limestone karsts to reach 2 temples of the first 2 Emperors in the 10th Century in Hoa Lu Ancient Capital; Hike up the Ma Yen Mountain to admire the King’s tomb, and enjoy the panorama view from the mountain. On the way back, stop in a local family to observe their daily lifestyle, chat and share a tea with them. 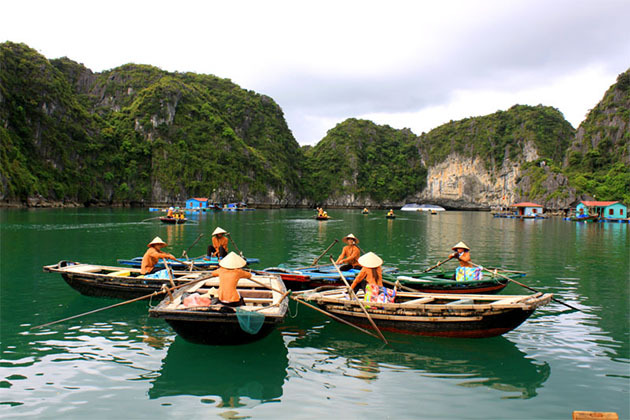 13:30 – 16:00: Boat trip in Trang An to enjoy the beautiful scenery and peaceful atmosphere. 16:00: Return to Hanoi by bus. 19:00: Drop off your hotel. Have breakfast at the hotel, then our guide and driver will come & transfer to airport for a morning flight to Hue. 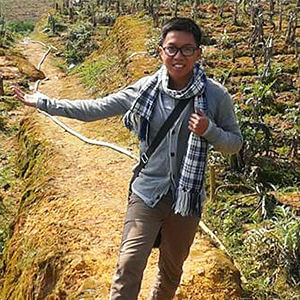 Upon arrival, you will be greeted by local tour guide and driver who then escorts you to the hotel. 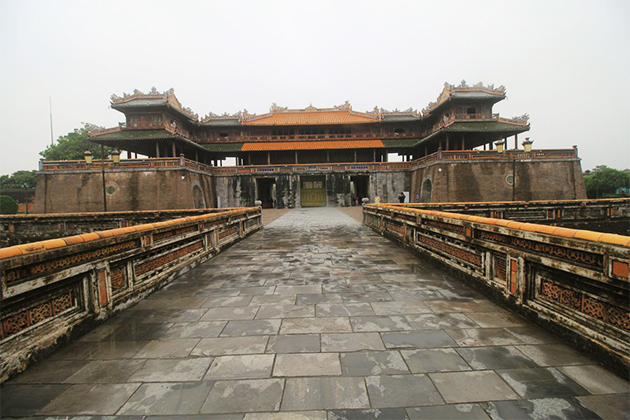 Later, we start to explore the historic and poetic beauty of Hue Imperial Citadel. 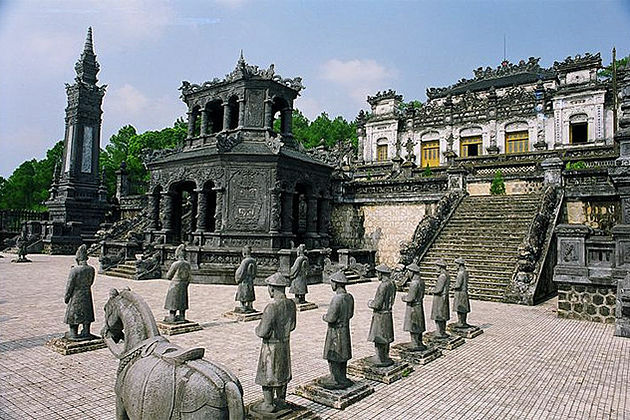 It is considered as a World Cultural Heritage site by UNESCO, which was the center of Vietnamese governance and politics during the Nguyen Emperor’s rule. 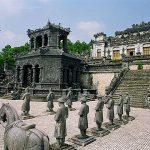 We also visit the Forbidden Purple City as the Hue Imperial Tombs which are scattered along the banks of the Perfume River. 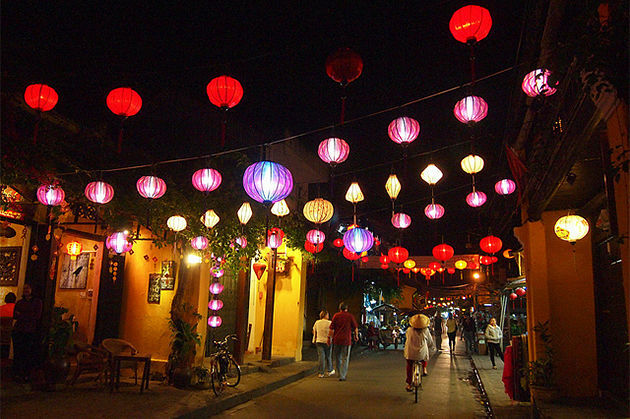 End up your city tour by a stroll around the Dong Ba Market, the largest market in Hue. 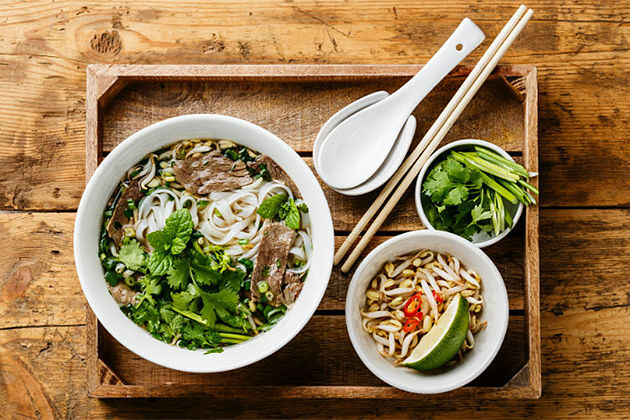 It is one of the few shopping venues in Hue, attracting tourists looking for authentic experiences like witnessing the local lifestyle, shop for souvenirs and sample street food. Back to the hotel in the late afternoon for relaxing. 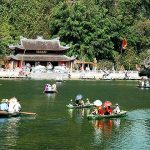 Pick up at the hotel in Hue, we will take a short drive to Toa Kham wharf for a leisurely cruise along Perfume River to visit Thien Mu Pagoda – the symbol of Hue located by the river. 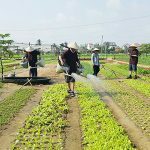 We then stop at Dong Ba market and buy necessary ingredients for the cooking class before continue cruising to Thuy Bieu village – the Garden of Eden in Hue. On arrival, we walk or bike around the village with stops to visit a local garden, old ancestral temple and communicate with local people. Stop at an incense-making family and the locals working strenuously with joy and enthusiasm. 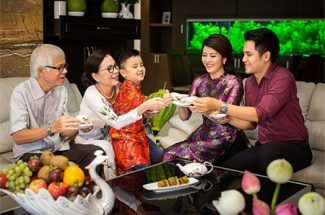 Continue to a joss-paper making family, chat over a cup of green tea with the family and see they’re talking about the joss paper, other known as ghost money offering to the dead. Lastly, we stop at a paper-painting family to see countryside painting of young local artists. 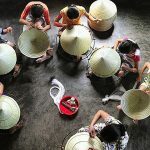 Back to Thuy Bieu restaurant for a hands-on cooking class with chief’s instruction, sit down and sample your effort of some traditional Hue dishes. Relax by soaking your foot in medical herb water and enjoy an excellent massage by the blind people before our car transfers us back to the hotel. After breakfast, we get on our bike and ride to the outskirt of Hue towards Thanh Toan Bridge (roofed in Chinese style). Along the way, we pedal through small villages along verdant fields, stops for photo shots or chat with locals about their daily life. 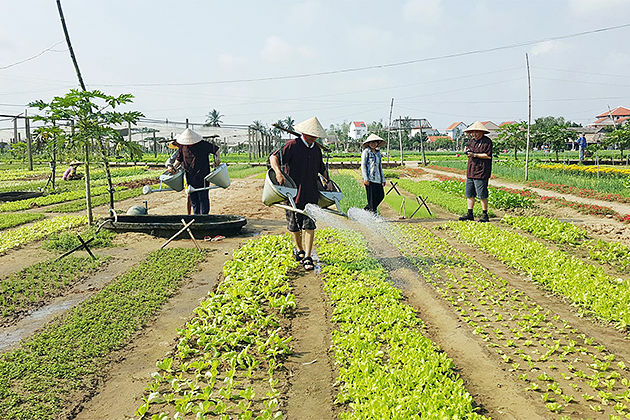 Next, we stop at Thanh Toan Agricultural Museum to understand more about the importance of agriculture on the life of the locals. As we reach the Thanh Toan Bridge, we will listen to the guide explaining its history and significance. Wander around the nearby market, observe the way people live their daily life and see various local products from fresh vegetables, meats, fishes and other poultry. 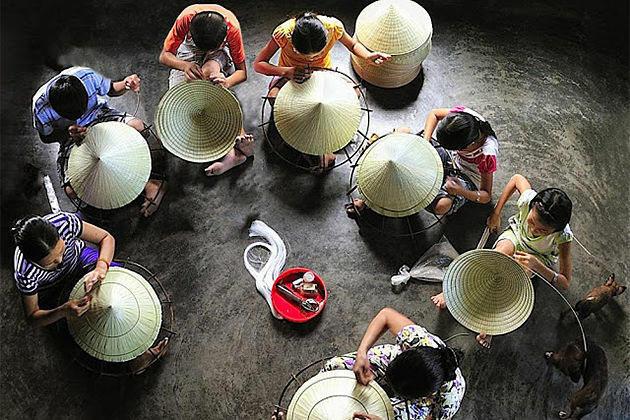 Continue cycling to some traditional handicraft villages of Hue making ‘Conical hat’ (Non la) and some others. Back to the city center in the afternoon, continue pedaling around the city before returning to the hotel. Following your breakfast, we take a dragon boat trip along the Perfume River down to Thien Mu Pagoda where we can enjoy the panoramic view of poetic Hue city. From here, head to historic King Khai Dinh’s tomb and Tu Duc’s tomb. 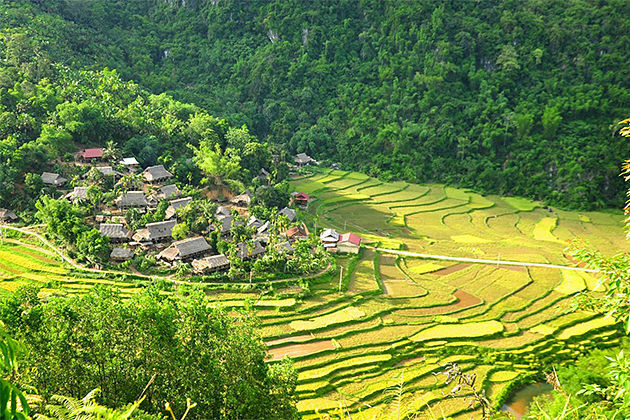 After that, we travel by train to Hoi An along scenic highway 1A. En route, we will stop to contemplate the stunning views North, to Lang Co Beach and South to Danang city. On arrival in Danang train station, we will have a brief visit to Cham Museum – the houses of the most complete collection if Cham Artifacts anywhere in the world; China Beach – named and used by the American as a relaxing place; and the Marble Mountain – considered to the place harmony with the five elements of the Universe (water, wood, air, fire and earth). Afterward, we drive to Hoi An in the afternoon and you are free to chill out for the rest of the day. Head off to our Farming & Fishing Life Eco Tour in the early morning. The first stop is Tra Que Village where we will get a closer look into the local farming communities. We will help the farmers in preparing their land for sowing, fertilizing the garden using seaweed from the local river and watering it in using huge tin cans strapped to our backs. 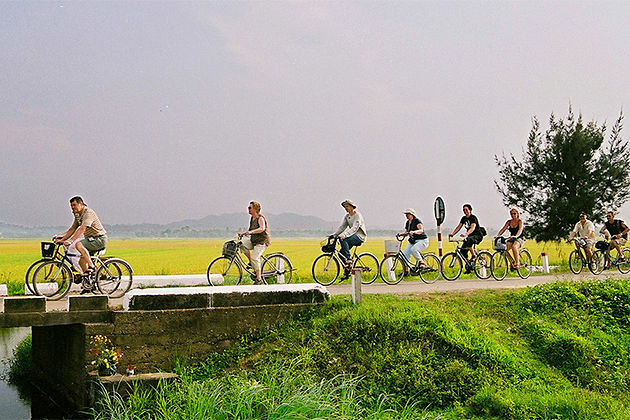 We then begin our leisurely cycling tour through the countryside witnessing local Vietnamese rural life first hand. Late morning we will board our Hoi An Eco-tour boat to cruise along the river. It is a great chance for you to meet and observe local fishermen working their craft, before trying a hands-on experience of traditional net fishing. 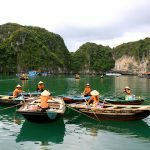 Following this, we transfer to a Vietnamese bamboo basket boat for a quick race and ride down a coconut palm-lined waterway. Your lunch will be prepared using vegetables picked earlier at Tra Que Village and served on the boat. After lunch, we will wander freely around Hoi An town center before heading back to the hotel. In the afternoon, we transfer/ walk down to downtown for our walking tour. 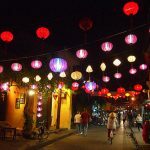 Start walking tour around the old town to visit the Japanese Covered Bridge, Tan Ky old house, the Pottery Museum, the Cantonese congregation, the silk street of Hoi An, the temples and pagodas of Chinese appearance. Time will be on your own. You are free to explore every corner of the ancient town! After breakfast, we will be free until your driver arrives to transfer you to the airport for your onward flight to Ho Chi Minh City. Welcomed upon arrival at Tan Son Nhat airport in Ho Chi Minh City, then you will be escorted to the hotel. Check in the hotel and take free time afterward. 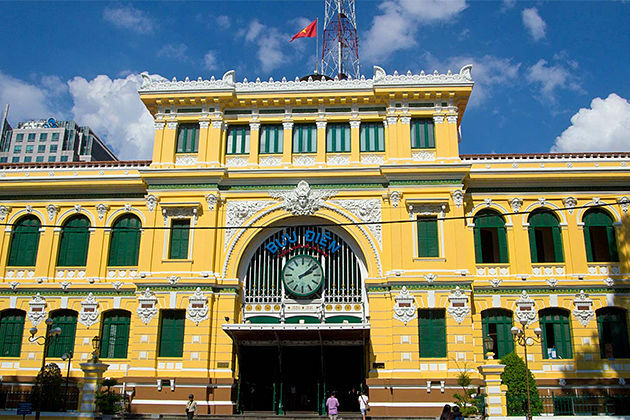 Known as Saigon, Ho Chi Minh City is the largest and most bustling city of Vietnam. Our day trip today covers almost highlight tourist attractions. 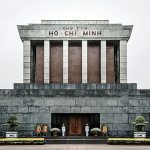 Learn more about the history of the War Remnants Museum and the Reunification Palace, admire the Center Post Office, Opera House and Notre Dame Cathedral by its French-colonial architecture, and experience the longest tunnels made of Vietnamese people during the war….A visit to Cu Chi Tunnels depends on the condition of weather and season. Morning, we head to the Cu Chi tunnels, known as the “Iron Triangle” or “Iron Land”. We will first see a short introductory video showing how the tunnels were constructed. Then you will have an amazing opportunity to discover the maze of tunnels. Or you just opt to admire various mantraps and the remains of an American tank as well as numerous bomb craters made by 500lb bombs dropped by B52 bombers. After exploring, we are back to Ho Chi Minh City for lunch. Your afternoon journey takes you to visit the Reunification Palace, the former Presidential Palace of Vietnam’s president in the south. 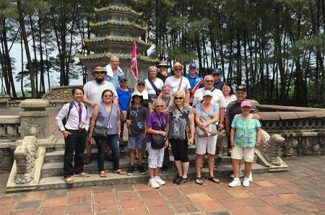 From here, we continue the way to the War Remnant Museum, where we can learn more about the second Indochina war through countless artifacts, photographs, and pictures. Also, we stop at Notre Dame Cathedral and Old Post office to get good shots for our memory of the biggest city of Vietnam. It’s a big mistake if we leave Ho Chi Minh City without a visit to Ben Thanh market. Fulfill your city tour today at this bustling market before returning to the hotel for overnight. Have lunch at a local family. 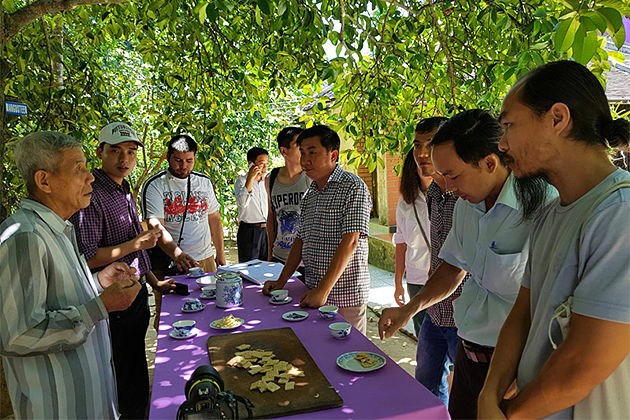 After that, we continue to walk around and taste some kinds of fresh fruits while listening to traditional music. This trip would not be completed without an interesting experience of biking! 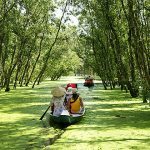 Imagine that you pedal along paths to see the local farms, houses, real life and the ancestral ways to pick up fruits in Mekong Delta…The cruise will end at Vinh Long city where we take our own vehicle to Can Tho. 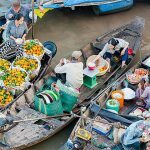 Today, we take a boat trip cruising Cai Rang floating market with the busy sense right at the time. 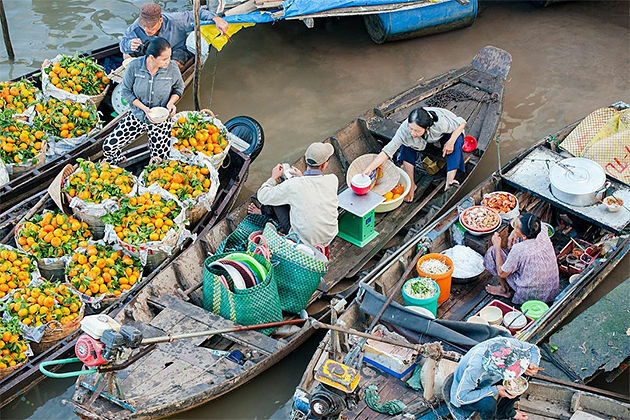 The biggest floating market in Mekong Delta, Cai Rang offers tourists a panoramic view of local daily life on board. After that, you will be back to the hotel, relax until check out. 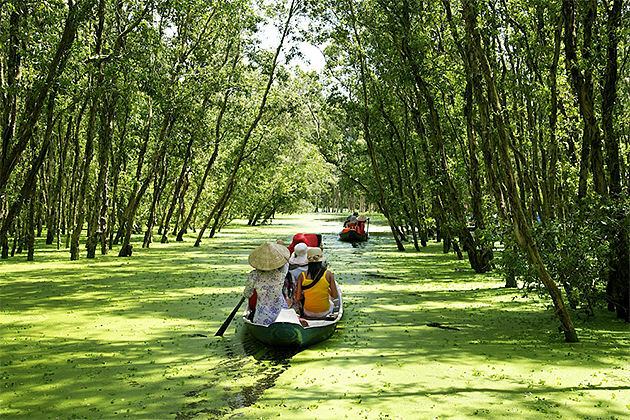 At noon, we will head to Chau Doc for voting Tra Su Cajuput Forest – beautiful landscapes and serenity of the must-see destination in the Mekong Delta. This time, water covers the entire area of the cajuput forest, facilitating boat rides around there. After that, we move to the hotel in Chau Doc. 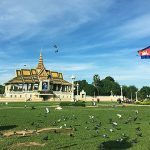 Upon your arrival at Phnom Penh International airport, welcome by our local guide and driver who will transfer you to the hotel for check-in. In the afternoon, we will have a guided tour of the National Museum, the Royal Palace with the Silver Pagoda. Soak up some spectacular buildings such as the Throne Hall, the Royal Treasury Hall and the Napoleon II villa in the Royal Palace. Silver Pagoda (Pagoda of Emerald Buddha), steps are crafted from Italian marble, and the regal floor within the throne room consists of more than 500 solid silver blocks. The currently king’s residence is living in a separate hall. 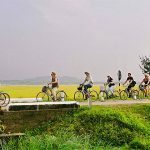 In the evening, we will take a Cyclo excursion along the Mekong Riverfront and passing Wat Phnom, one of the significant site of Phnom Penh. 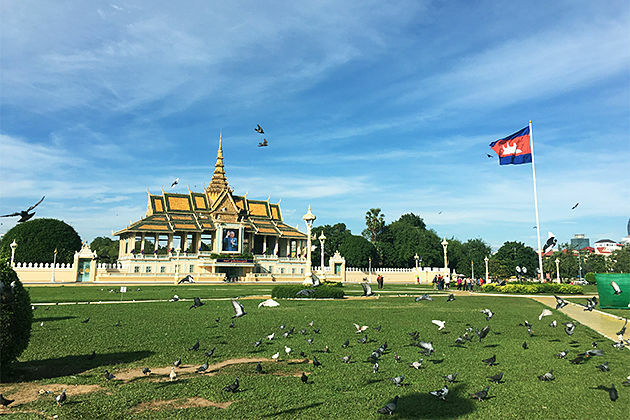 After breakfast at the hotel, your tour guide and driver drive 15km out of Phnom Penh to see Beoung Cheoung Ek Memorial Museum (Killing Fields), and then back to Phnom Penh to the Tuol Sleng Museum (S21). 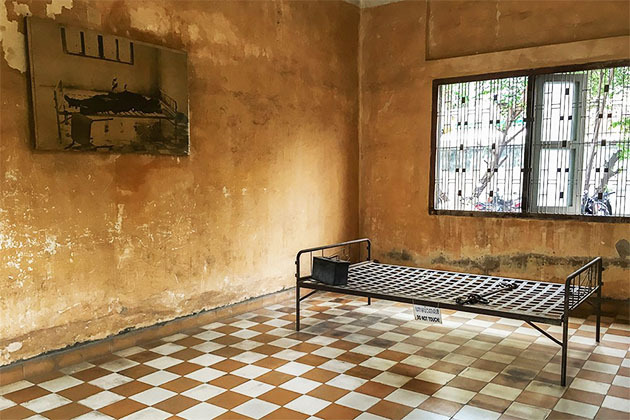 As you arrive, you will see a documentary film about the Khmer Rouge regime and the genocide of Pol Pot. 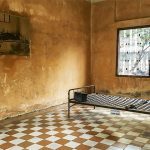 First, the victims who are detained and tortured at S-21 prison (Tuol Sleng Museum), were transported to the extermination to death. Cambodian Government constructed a massive Stupa (Memorial Monument) to keep some of those skulls, bones, and pieces of clothing for a yearly ceremony to bring peace to the spirits of the deceased. 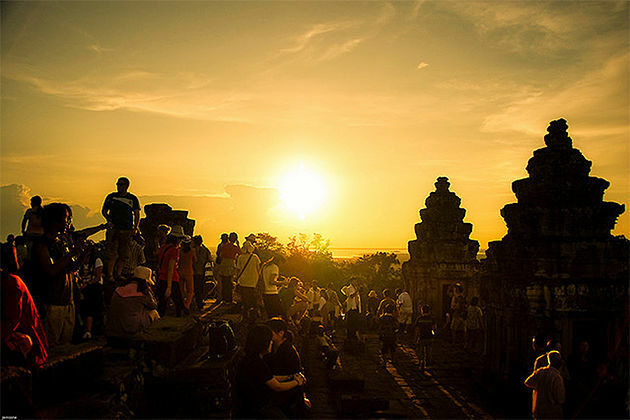 After the tour, you will be transferred to the airport for your departure flight to next destination – Siem Reap. Welcome upon arrival in Siem Reap, you will be escorted to the hotel by our guide and driver. Morning, we enjoy a drive through the lovely country to the Kulen Mountain of 70km from the town. Climb the mountain and visit the great waterfall and an ancient stream carved with thousand of lingams, god and deities of Hindu on the edge of the stream of more than a thousand year ago. Next, we visit an old Buda statue, lie reclining, carved on a giant mountain rock, then swim at the waterfall and have a picnic lunch on the river bank. Climb down the mountain back to town. 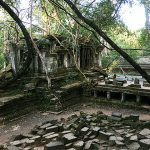 Afternoon, we continue by the trip to soak up more of the surrounding temples, return in the direction of Siem Reap, stopping to explore another of the lesser visited temples – Beng Mealea. 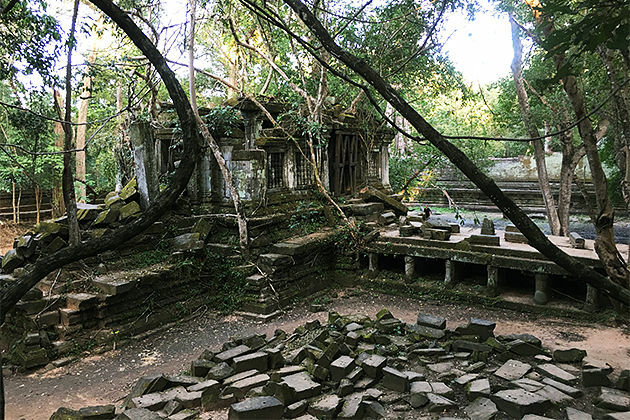 This temple is utterly swallowed by jungle and lack of restoration work. Tourists visiting the site can easily to imagine what it must have been like for early explorers discovering these temples for the first time. 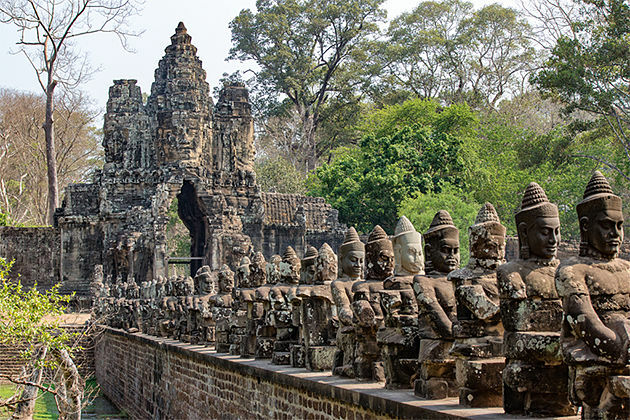 Enter this last capital of the Khmer empire through the Southern Gate where giant carvings of gods and demons flank each side of the entrance. 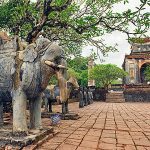 Get an insight onto the ruins of Royal Enclosure, Phimeanakas, Elephant Terrace and Terrace of Leper King. Feel the serenity exuding from the stone face carvings of the Bayon and temple walls covered in emerald-green moss intertwined with roots of the most charming of all, Ta Prohm. 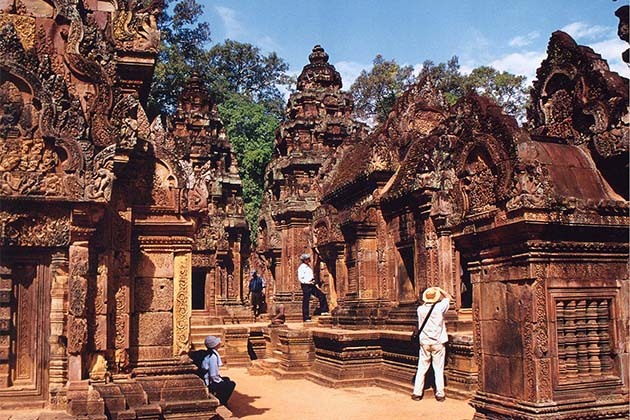 In the afternoon, an exploration of well-known Angkor Wat is waiting for you. Angkor Wat was an architectural and artistic masterpiece of the mighty Khmer Empire. 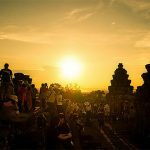 Take your camera out and catch the unmissable sunset with a panorama view from Pre Rup temple. This morning, we take a 30-minute journey to visit Banteay Srei, nicknamed the “Citadel of Women” mainly thanks to its pink sandstone façade. 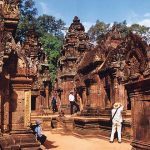 The temple is best seen in the morning light but is a true vision at any time of day and contains excellent examples of classical Khmer art. Continue to visit the Angkor National Museum, an institution that offers a glimpse into the rich history of the “Golden Era” of the Khmer Kingdom. 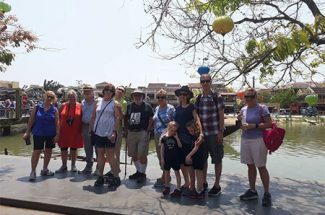 Tour will be finished in later afternoon; we continue our drive to enjoy on a wooden boat ride to the floating village of Kampong Phluck getting the first-hand look at the daily life of local fishermen. 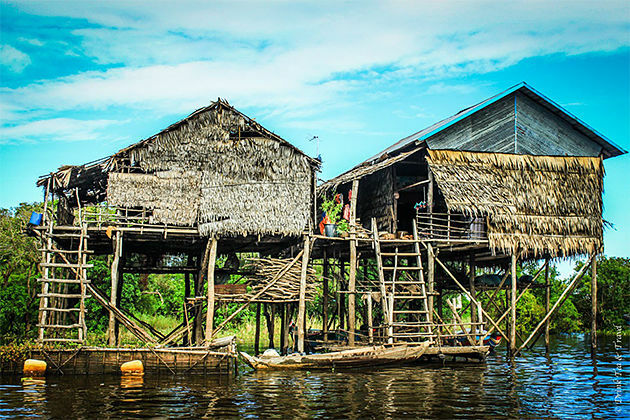 Similar to other floating villages in Southeast Asia, Kampong Phluck has floating houses on stilts, surrounded by flooded forests and has some rice paddies scattered here and there. 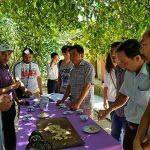 You can visit a local house, learn about their daily like and take advantages to become a fisherman with fish rod and baits if you wish. Drive back to town, we will continue to visit the school of fine art “le Artisans D’angkor”. You will be transferred to the airport for your departure flight to Ho Chi Minh. Arrive in Ho Chi Minh, welcome & transfer to hotel nearby airport for overnight. You have the last explore Sai Gon city this night. Time will be free until our drive transfers you to the airport for the departure flight. Trip ends. Local-stationed English-speaking tour guide. He or she will provide you with the best local knowledge available. 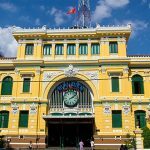 Flights: Hanoi – Hue, Danang – Ho Chi Minh, Pnompenh – Siemreap, Siemreap – Ho Chi Minh, Economy class of National airlines.